Software risk encompasses the probability of occurrence for uncertain events and their potential for loss within an organization. Risk management has become an important component of software development as organizations continue to implement more applications across a multiple technology, multi-tiered environment. Typically, software risk is viewed as a combination of robustness, performance efficiency, security and transactional risk propagated throughout the system. Most organizations don’t have a process to directly address the software risk that results from active custom software development. The traditional approach is to rely on testing – regression tests, system integration tests, performance tests and user integration tests. As you can see in the diagram, 30% of defects discovered in QA and live use are structural. And it is the structural defects that are the primary software risk exposure in the application lifecycle. Based on known software economics, that’s 25 defects per function point that directly lead to software risk. Adding a structural quality gate to the QA process is imperative in order to measure and prevent software risk in mission critical systems. Most structural quality defects are actually not related to code quality issues, according to industry sources. It's a common misconception that code quality tools might address software risk. In reality, structural quality requires system level analysis in order to detect defects that pose software risk. 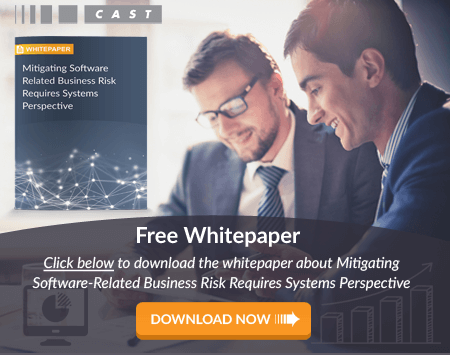 Why is Software Risk Analysis Imperative? Many organizations suffer from failed systems even when a vast amount of time and money are dedicated to functional testing methods. The functional approach does identify approximately 90% of the weaknesses that cause system failures; however, it does not account for less apparent issues capable of affecting response times, infrastructure stability, and component functionality issues between application layers. Software risk analysis solutions take testing one step further by identifying unknown weaknesses resulting from high severity engineering flaws in multi-tiered systems. Analysis solutions designed to locate these issues before execution provide an opportunity to assess potential occurrences and prevent problems before they blatantly become apparent. Software risk identification is imperative to business processes in a complex IT environment. Proper analysis puts your organization ahead of the curve by allowing for early identification of infrastructure threats and providing the information you need to efficiently manage them. Advanced analysis aids in the identification of software risks capable of bringing your entire infrastructure to a screeching halt. System wide failures result in lost revenue, customer dissatisfaction, data inconsistencies, and much more. Analysis solutions designed to assess business functions as measurable units within an application prevent these types of complications during the development process. If your organization is not taking the steps to properly manage these software risk factors in a complex infrastructure, costs or maintenance times resulting from undetected issues could be greatly hindering productivity, performance, or security. Are you struggling with pinpointing or managing potential problems in a complex IT environment? Is your organization capable of finding system critical issues prior to executing an application? CAST offers a dependable solution for early identification and prevention of software risks within a complex, multi-tier environment. Our Application Intelligence Platform (AIP) can help your organization analyze existing or upcoming deployments to locate and resolve potential issues before they become a bigger problem. If your organization is seeking a reliable method for assessing risk for complex applications, contact us today to learn more about how software risk analysis can benefit your organization.